A wise man once said that one picture is worth a thousand words. Yeah… that says it all. and Brian “Sabes” Sabean, who picked up guys like Ross, Pat “The Bat” Burrell, and clutch reliever Javier “J-Lo” Lopez when the Giants needed extra help down the stretch. On to the World Series! Categories: Celebritiana, Hero of the Day, I Love the Giants, Listology, My Home Town, Ripped From the Headlines, Sports Bar, That's Cool! The wheels of Common Elements grind slowly, but they grind exceedingly fine. Way back in the Dark Ages — or as I like to call it, 2004 — I commissioned the very first artwork in what would come to be known as the Common Elements series (two or more comic book characters, usually unrelated, but connected by some “common element,” as you regulars here already know) from Michael Dooney. From that day to this, my Common Elements gallery has grown to include more than 90 drawings (with a couple in the works) representing the work of 70 artists. But for whatever reason, I’d never asked Mike Dooney to create a second one. Which brings us to today’s artwork. 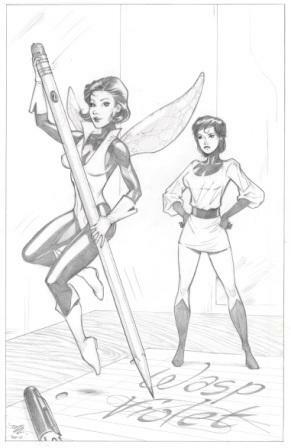 Mike’s assignment for this piece was to take two of the smallest heroines in comics — the Wasp, founding member of the Avengers, and Shrinking Violet, longtime stalwart in the Legion of Super-Heroes — and bring them together in a scenario that emphasized their diminutive size. Dooney devised this clever scenario, in which the winsome Wasp (as Stan Lee used to refer to her) asserts her self-perceived superiority over her rival with a swish of her pencil. Although Shrinking Violet is the character with the longer history (she made her debut in DC’s Legion in 1961, almost two years before the Wasp first appeared on the cover of Marvel’s Tales to Astonish #44), it’s probably fair to say that Janet Van Dyne (later Janet Pym, after she and her crimefighting comrade Henry Pym, the original Ant-Man, married) is the better known of the two. The Wasp became one of Marvel’s most prominent female heroes, in addition to one of its earliest, thanks to her role in the Avengers. Over the years, the Wasp gained significant notoriety for her frequent costume changes. Janet, a wealthy heiress with a taste for high fashion, updated her ensemble so many times that it’s difficult to pinpoint a specific “look” for the character. I chose the outfit depicted her by Mike Dooney because it’s one of the most attractive and distinctive of her numerous styles. Shrinking Violet (her real name is Salu Digby — I’d prefer Violet too) joined the Legion as part of its first big expansion. Such familiar Legionnaires as Sun Boy, Bouncing Boy, and Brainiac 5 came aboard at about the same time. Like the Wasp, Vi (as her colleagues often call her) has undergone several costume changes, usually as part of the Legion’s seemingly endless rebooting. Unlike the Wasp, Vi has also changed her code name from one incarnation to the next, having also operated under the guises of Atom Girl, LeViathan, and Virus, as well as just plain Violet. Despite her name, most of Vi’s outfits over her long career have been predominantly green, not violet. (The ensemble shown here, for example, was solid green with black accents.) But that’s comics for you. October being National Breast Cancer Awareness Month — and if you weren’t aware, you are now — I thought it would be appropriate to devote one Comic Art Friday this month to my favorite “breast story” related to my art collection. About five years ago, artist Geof Isherwood had this gorgeous pinup of Wanda Maximoff, the Scarlet Witch, posted for sale on eBay. I fell in love with the piece at first sight. There’s something magical about the expression Geof gave Wanda here that I found compelling — innocent yet wise, inviting yet inscrutable. Geof’s a master at lending his characters depth and humanity, and this depiction of one of my favorite heroes might be among the finest he’s ever drawn. In the artwork as Geof originally drew it, he’d blessed Wanda with Power Girl-sized mammaries — what Otter in National Lampoon’s Animal House famously referred to as “major league yabbos” — barely restrained by an abbreviated bustier that left next to nothing to the imagination. So I did, and he did. Half a decade later, this spectacular item remains one of the true gems in my Scarlet Witch gallery. The best part of this story is that Geof was comfortable enough with himself as an artist to make the suggested alteration. A lot of artists would simply have said, “Hey, this is how I drew it. Take it or leave it.” It wasn’t a commission, so Geof wasn’t under any obligation to change his original vision to suit my sensibilities. But he did it without complaint. I respected him even more than I did already after that. He really is a terrific guy, in addition to being an awesomely talented drawer of stuff. If you’ve got ’em, learn to examine them regularly for changes. Stay current on your mammograms, if you’re over 40. Whatever your age, open a frank, no-holds-barred dialogue with your physician about your risk factors for breast cancer. If you don’t have ’em, half the people you know do. Encourage the women in your life to follow the above program. One in eight of those women will be a target for breast cancer at some point in her life. Whether you have breasts or don’t, please consider making even a small donation to the breast cancer nonprofit of your choice. Every little bit helps in the fight. 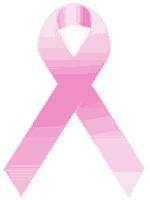 Let’s find a cure before we lose more of our wives, lovers, mothers, daughters, grandmothers, aunts, nieces, and friends. Wanda and I thank you. I’ve heard some lame excuses in my time, but this one touches bottom. In Manatee County, Florida, 25-year-old Raymond Stanley Roberts was pulled over by sheriff’s deputies in a routine traffic stop. When the officers smelled the familiar aroma of marijuana, they conducted a search of Roberts’s person. During the search, deputies discovered what appeared to be a small, soft package firmly ensconced between Roberts’s buttocks. This object proved to be a baggie filled with 4.5 ounces of cannabis. Additional manual inspection of the suspect’s nether regions turned up yet another bag, this one containing 27 chunks of rock cocaine, weighing a total of 3.5 grams. What say, Ray? Only some of the junk in your trunk is yours? With this simple yet eloquent sentence, Roberts easily outstripped previous Lamest Excuse Ever recordholder Lindsay Lohan, who once famously denied that the cocaine that police found in her pants was hers, given that she was wearing someone else’s pants. I’m not sure how one would go about convincing the authorities that the buttocks upon which one was seated were someone else’s buttocks, but if it works, it works. Apparently, it didn’t work for Mr. Roberts. He was charged with possession and is presently free on bail. Categories: Aimless Riffing, Ripped From the Headlines, What's Up With That? It’s getting Orange up in here! 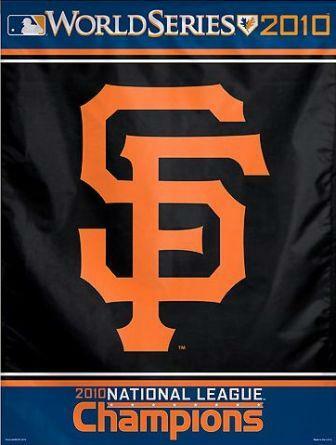 Your San Francisco Giants are the 2010 National League Western Division Champions. This is all you know in life, and all you need to know. Way to go, G-Men. Bring on the Braves! Categories: Hero of the Day, I Love the Giants, My Home Town, Ripped From the Headlines, Sports Bar, That's Cool! It’s that time again: October is National Breast Cancer Awareness Month. If you’ve read this blog often over the past six-plus years, you know that the cause of breast cancer awareness is close to my heart — no pun intended. My wife KJ was first diagnosed with breast cancer in September 2000. In February 2007, a metastasis (that’s a fancy medical term meaning “spread”) of the disease was identified. And, as most of you know, breast cancer finally claimed KJ’s life on July 5 of this year. She was 44 years old. She had spent nearly one-fourth of her life battling this miserable disease. We need a cure for breast cancer. Not within the next generation. Not within the next decade. Not a year from now. Today. Every 69 seconds, a woman somewhere in the world dies from breast cancer. You can’t read that statistic and not be horrified. One in eight women will be affected by this disease. Your mother. Your sister. Your lover. Maybe you. If you’re a woman, talk with your personal physician about the preemptive testing program appropriate to your individual risk factors. If you’re not a woman, encourage all the women you know to follow the above advice. If you have a few loose dollars in your wallet, consider donating them to the breast cancer charity of your choice. If you need help selecting one, KJ’s favorite was Susan G. Komen for the Cure. Let’s stop having to read obituaries like this one. Categories: Breast Cancer Awareness, Dead People Got No Reason to Live, SwanStuff, That's Cool!